The Phase 1 Habitat Survey is a staple in the ecologist’s toolkit. A clear, logical and easy to interpret system that allows the classification of habitats on different levels based on the predominant or common species. Whilst the basic principle has remained unchanged for decades, there have been advances in how we collect the data. Up until quite recently, you would most likely see an ecologist wandering round with a photocopy of an Ordnance Survey map and a selection of their favourite coloured pencils. A combination of cartography and artistic flair would see the creation of an informative and often beautiful map depicting variations in habitat and notable ecological features. Make a mistake, however, and it’s back to the drawing board. Come back a few years later, to update any changes and you are either starting from scratch, or using a lot of Tipex. With the development of personal computers, these maps would be scanned and inserted into the final document. As digital cartography developed, maps that had been hand drawn in the field would be digitised back in the office allowing manipulation of the data, and amendments to be made as situations changed. Over the last decade, developments in mobile computing have allowed the collection and digitisation of data in the field. Whilst revolutionary, various factors limited widespread use. One of the main factors was price, with devices and software costing thousands of pounds use was restricted to large organisations with significant funding. Additionally, the technology was still in its infancy, with limitations in accuracy, screen size, and processing power. Until quite recently, Portable Digital Assistant’s (PDA’s) available for mapping, had small screens with such low resolution that drawing a map was akin to playing Tetris. Add in the effect of scratches, glare and rain, and you have the perfect recipe for frustration and mistakes. Fortunately, the rapid development of mobile phone technology has facilitated the evolution of the PDA into the tablet. The average mobile device now has considerably more processing power and data storage capacity than the computers that took astronauts to the moon, and screen sizes to suit all tastes. Sadly, most are used for little more than Facebook and Candy Crush, but for those with an interest or a need, the possibilities are (almost) endless. We now have a range of options for digital habitat mapping in the field. If you are feeling flush there are proprietary systems with ruggedised tablets and the latest commercial software that will integrate seamlessly with your computer back in the office. If you can’t stretch that far, Oxford Brooks University have developed an app for Apple devices that allows easy habitat mapping in the field along with straight forward integration with most common GIS (Global Information System) software packages. For those of us with an even tighter budget there are open source solutions compatible with Android devices. QField is an Android app based on QGIS, a mapping package developed and used by a global community. With QField you can collect geographic data in the field on any Android device (with enough processing power). 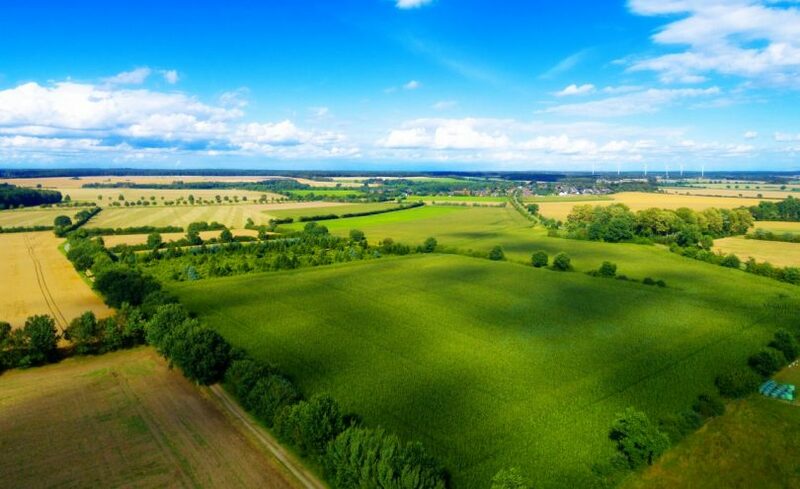 Aerial photography has, for a long time, been an invaluable tool to assist in the planning of a survey, especially since the advent of free online maps. But they have been unable to replace a surveyor in the field because of difficulties in interpretation of biological features. You may be able to tell that it is a tree, but can you narrow it down to genus or species? Whilst the first aerial photos were taken in the 1850’s, it didn’t really take off (no pun intended) until the first world war. All images were black and white so identification of objects relied on shape and tone. Colour photography added a new dimension to aerial mapping with the development of three channels: red, green and blue (RGB), the first multi-spectral imaging. Whilst this allowed a lot more information to be interpreted from an image, it is still limited to what we can see. Landsat satellite imagery has provided another level of detail with the inclusion of up to 11 channels ranging from ultraviolet to infrared. 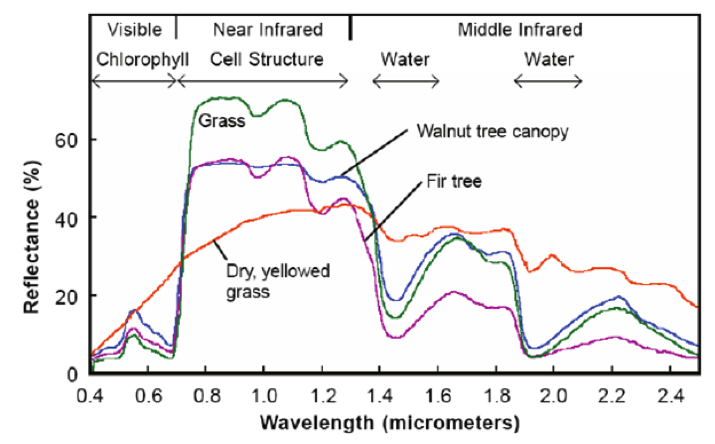 One product of this is the Normalised Differentiated Vegetation Index (NDVI) which uses the difference between red and infra-red reflectance to give a measure of plant health. This has been applied to precision agriculture and forestry to monitor growth and disease, and to assess water and nutrient supply, and can help in the differentiation of habitats, but it requires very specialist interpretation. In contrast, hyperspectral imaging may have hundreds of narrow bands giving very high spectral resolution. This allows the recording of a precise spectral signature at each pixel. Just as spectroscopy has allowed astronomers to identify what elements or compounds a distant star is composed of, the same technique can be used to identify different plant species, communities and habitats. If you know the spectral signature of a plant, it then becomes possible to map a species or habitat by identifying which pixels contain that signature. The advantage of this technology is that it is not targeted. You don’t capture the data for just one species or one habitat. By collecting hyperspectral data, you are creating a bank that can be mined time and time again. Having mapped the habitats on a site, later you can extract the distribution of an invasive species saving considerable time and money. Once you have created a hyperspectral map, it is possible to return to the same data set to ask a different question. Typically, hyperspectral cameras cost hundreds of thousands of pounds and are so heavy you need a helicopter to carry it. Fortunately, technology moves fast. Some hyperspectral cameras are now the size of an action camera, and can cost less than £20k. A camera that small can easily be mounted on a drone, opening the technology up to a much wider audience. Could this be the face of habitat surveying in the future? We have come a long way from the days of paper and pencil, but whilst technology changes the way we work, the value of the Phase 1 Habitat Map persists. However, we choose to collect the data, the purpose remains the same; a standardised system for classifying and mapping wildlife habitats. 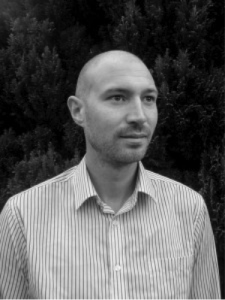 About the Author: Alan Cowlishaw has been working in construction, energy and transport infrastructure as an ecologist and as an IRATA rope access supervisor for 14 years. His ecological experience has been gained in research and consultancy both in the UK and overseas. He is now Senior Ecologist for Egniol Environmental Ltd, based in Bangor, Gwynedd. Holding Natural England and Natural Resources Wales Bat Licenses, Alan has extensive experience in carrying out ecological assessments and surveys for bats and reptiles. Other survey experience in the UK includes badgers, aquatic invertebrates, amphibians and nesting birds. Overseas Alan has carried out research into Anolis lizards in the Caribbean with Bangor University, Bonobo Chimpanzees in the Congo with the Max Plank Institute, and Baboons in Namibia with ZSL. Alan lives on the edge of Snowdonia National Park and spends his spare time walking the dog, kayaking and experimenting with emergent technologies.